Today I bought some Space Bags. Normally, I’m not a big fan of buying anything I see on TV, but in my effort to organize and make more room, I did a quick analysis of what was taking up the most area. I have bins upon bins of clothes that the kids have outgrown, duvets, comforters, pillows, sleeping bags, sheets and enough blankets to cover all the homeless sleeping on the beaches. It seems that I should be making a donation to my local Goodwill, but these are things I don’t want to get rid of. Most of those blankets are homemade baby blankets and I like to switch out the duvets every once and awhile. I started off taking the biggest and bulkiest of the linens and shrinking them down into almost nothing. Next up were the baby blankets…sucked flat as a pancake. I had used 3 of the 5 bags and I had freed up one huge bin and a 3’x2′ box, which I did throw away. I only had one bag left since the 5th bag is a travel bag, which I intend to use for just that. I could probably get a whole other set of the Space Bags and fill them up. I haven’t decided if I’ll do that yet or not, but with this last bag, I can’t decide what to use it for. What lucky box of clothes, sheets or pillows gets to go into that last bag? I can’t decide! Whenever I find a product that I really like, I try to find a billion ways to use it. For example, Mod Podge. I was Mod Podging anything and everything I could get my hands on. My glue gun is another favorite. When I heat that sucker up – if you don’t want it glued, you better make sure it’s at a safe distance from the length of the cord. 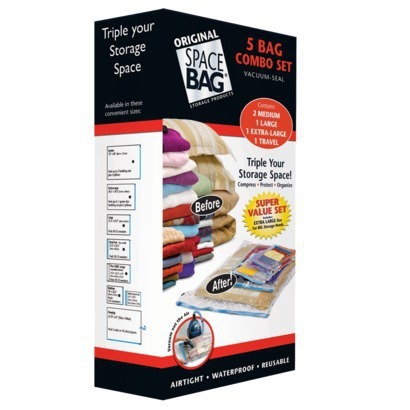 So now I think I need to go back and buy another box of Space Bags because every which way I turn, I am thinking, I could put that in a Space Bag. We spent $30 and have increased the area in our house to a much more tolerable level. That is as long as we don’t buy anything else and don’t need to get anything out of the boxes stacked in the kids’ closets. This entry was posted in Miscellaneous Ramblings and tagged Glue Guns, Mod Podge, organization, Space Bags, storage by Amy. Bookmark the permalink. I, too, was once a fan of space bags until I opened them up some time later and the plastic seemed to react with the contents. Anything touching the plastic ended up yellowing. Sorry to burst your bubble, but you may want to open them all back up and line them with tissue or something. Oh man, seriously? You totally burst my Space Bag! Actually, I don’t really care if it turns yellow. My wedding dress is in a Space Bag, but Kamryn takes it out and puts it on all the time so that is probably keeping it from yellowing. *raises hand* Excuse me, miss… ummmm… what’s a Mod podge? Mod Podge is crafting glue.